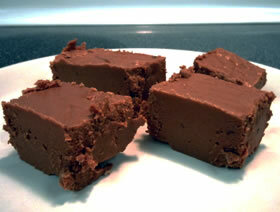 This is Aunt Ruth's recipe for homemade fudge. Combine sugar, margarine, and milk in a pan. Bring to a full boil - boil for 5 minutes - keep stirring. Remove from heat - stir in chocolate until melted - blend in marshmallow creme and vanilla. Pour into a 13x9 inch pan. Cool at room temperature. Cook time is 15-20 minutes. Cooling time may vary.